The Ritz-Carlton, Denver introduced five-diamond hospitality to Colorado’s Mile High City in 2008 when it moved into 14 floors of a 38-story skyscraper. 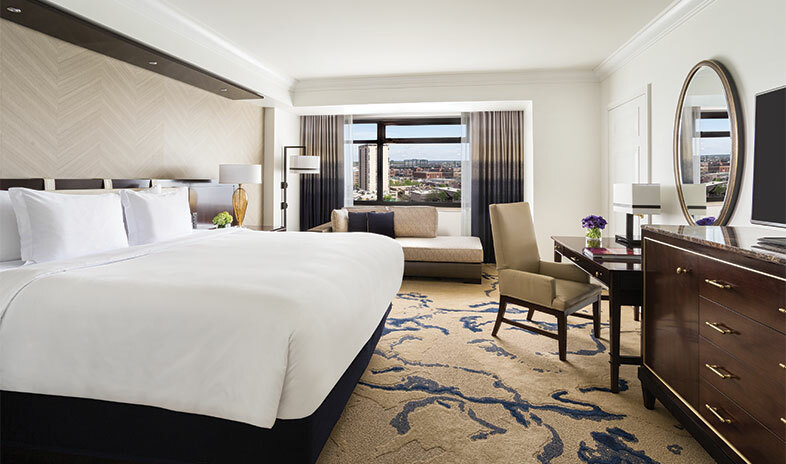 Ideally situated in the heart of downtown, with views of the urban scene and mountains, the guest rooms and suites—the largest in the city—feature amenities such as feather beds and Frette linens, oversized tubs, rain-forest showers, steam-free bathroom mirrors, and in-room espresso makers. While an exclusive, remodeled lounge treats Club Level guests to complimentary food and beverage, everyone enjoys access the newly reimagined lobby and lounge (featuring local art), casually elegant steak and seafood dining at Elway’s Downtown, pampering at The Ritz-Carlton Spa, state-of-the-art workouts at a Ritz-Carlton fitness center, and three floors of complimentary activities like rock climbing at a neighboring fitness club. Other nearby attractions start with Larimer Square, Colorado Convention Center, the state capitol, Coors Field, and Denver Performing Arts Center. Back home, the hotel’s sense of contemporary sophistication, rich wood tones, and natural stone extends from the lobby and guest rooms to the spa and meeting space. The venues—all remodeled in 2017—include Denver’s largest luxury-hotel ballroom, a junior ballroom, and eight board- and breakout rooms for groups of up to 500, all clustered on one floor and supported by generous prefunction space and an outdoor terrace. A conference concierge serves as the point person for all departments, ensuring success in everything from general assemblies to seminars, breakfast meetings, and formal awards banquets. Elegant hotel in the heart of LODO historic area. Staff is very accommodating. Ritz Carlton level of excellent service. Everytime I have a meeting in Denver, we always host our meetings at this property. This is one of nicest Ritz Carlton's I have had the pleasure in staying in. The service is always top-notch and the food is great. The banquet food is the best I've had. The staff throughout the hotel is top-notch!